Michiganders building trade ties to China wonder what’s next? These are certainly interesting, if not precarious, times for China and the U.S., and the people who working hard to build stronger economic ties between Michigan and the Asian nation. People like Gov. Rick Snyder, Consul General of the Peoples Republic of China-Chicago Hong Lei, Glenn Stevens, Lisa Gray and Brian Connors who are doing their work in the wake of the saber rattling President Donald Trump did on the campaign trail over what he called a trade imbalance with China and other concerns. Trump threatened tariffs of 45% on Chinese imports to address the imbalance. And he ruffled some feathers in China when he accepted a congratulatory call from the president of Taiwan (the countries are at odds) after the election. Appearing at a National Prayer Breakfast on Thursday in Washington,Trump repeated his promise that the U.S. will be tougher in dealing with other countries. How much of what Trump said was campaign rhetoric? And how many of his edicts will come to fruition? Many are holding their breath. Count Connors, executive director of the newly created Michigan-China Innovation Center, among them. The Michigan-China Innovation Center opened with a goal of attracting Chinese investment to Michigan. It is being funded by the Michigan Strategic Fund, which is part of the Michigan Economic Development Corp. Currently, Michigan has nearly 200 Chinese-owned firms that contribute more than $3 billion in foreign direct investment. Jerry Xu, president of the Detroit Chinese Business Association, is taking a longer view about the new world order under Trump. He says new presidents often go through a rough ride at the beginning of their terms concerning the relationship between the U.S. and China. Both Michigan and China have reasons to want to keep things calm. Detroit’s auto industry looks to China and its huge and growing middle class with potential to buy millions more cars as a place to grow business. China seeks places in which to invest, and Michigan — with its enviable engineering prowess and abundance of natural resources — is a ripe market for consideration. Snyder has been leading the charge to foster more business with China — making the country the destination of his first trade mission upon taking office in 2008. His goal — create more jobs for Michiganders. Snyder will join hundreds of business, political and community leaders from Michigan and China at two different events Saturday, both celebrating the Chinese New Year in metro Detroit. The Detroit Chinese Business Association will hold its annual Chinese New Year Gala Celebration at Cobo Center. 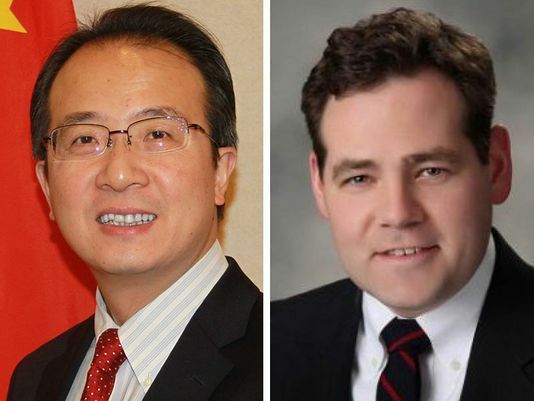 In Dearborn, representatives of the Consulate General of the People’s Republic of China in Chicago will gather with representatives of the Guangdong Provincial Government, the North American Chinese Coalition (NACC) and numerous other local organizations. Liang Xinjun, cofounder, vice chairman and CEO of Fosun International, which employs 1,000 people in Michigan, will be the keynote speaker. Gray, the chair of the NACC, is hopeful about future business relations. Lei said the Motor City and Great Lakes State are resonating in China. I am sure that has something to do with Mayor Mike Duggan going to China last year along with Gov. Snyder. Stevens, executive director of MICHauto, which is part of the Detroit Regional Chamber, agreed that fair trade is vital for business in Michigan and the U.S.
“Open trade and fair trade, with the absence of currency manipulation, are central to the way we do business as a nation, but more specifically to enable U.S. companies to execute globally,” Stevens said.